Happy Friday guys! The week went by pretty quickly, I guess it's because my brother is here for a short visit and he's leaving on Sunday! Anyways, on to the good-but-useless news! *hahaha* I got my own Resort's World Card! *yay* Hey, don't give me that shocked look lady! I'm not a gambler and will never be, but I won't be a party pooper inside a casino! I'm scared of losing huge amount of money so I always set a side a very small budget just for the experience and fun! And one game I would totally try aside from the Roulette? It's the Big vs. Small game! My brother and I played the game once inside a hotel in Macau and my bet was multiplied by 2 and I immediately cashed out! (I'm a sissie that way!) hehehe My brother, on the other hand, has the luck, his bet was multiplied by 16 but he continued to play and before we get to zero, I asked him to leave! So yes, I'm nagging gambling partner! 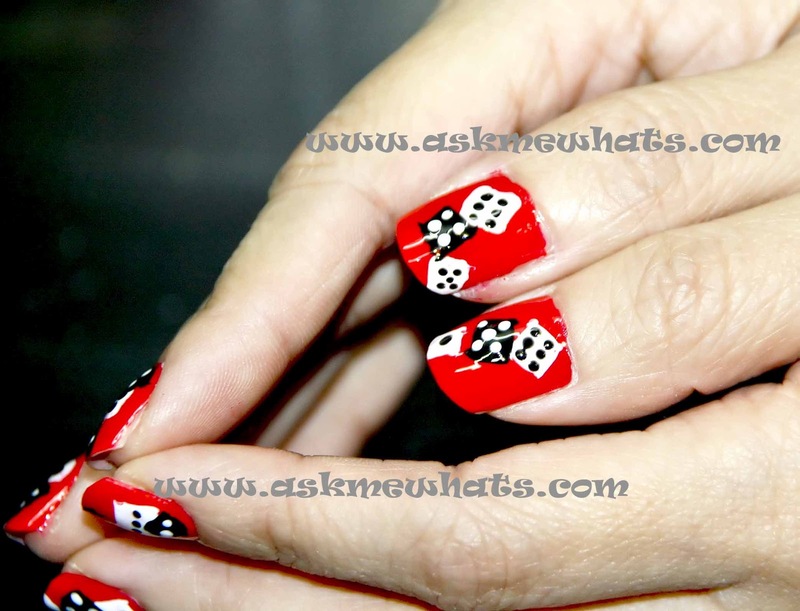 Today, I've created a nail art design to celebrate the game I can play at the casino. Apply coat of your favorite base coat to protect your nails from chipping and yellowing. I used ZOYA Base Coat. Using Revlon's Fearless Nail Enamel, I applied 2 coats of it and let dry. Red will always remind me of casino and luck! Using a dotting tool, an art brush, or L.A. Art Deco Polish in Matte white, draw a square as shown on photo below. This will be the dice! 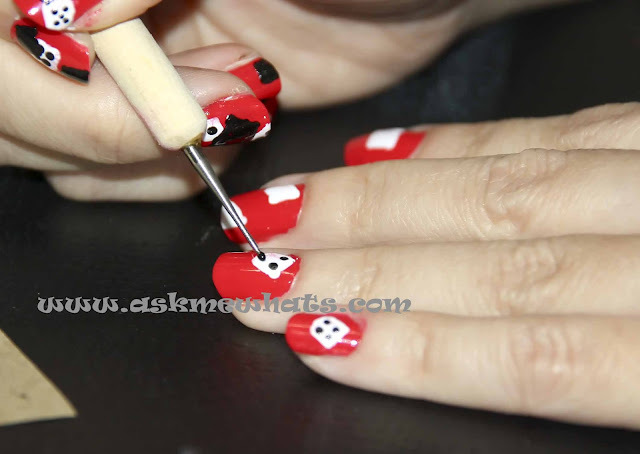 Using a toothpick, or dotting tool, create black dots on top of the white square once the base is completely dry! I had fun picking the dice digit! Mix it up! 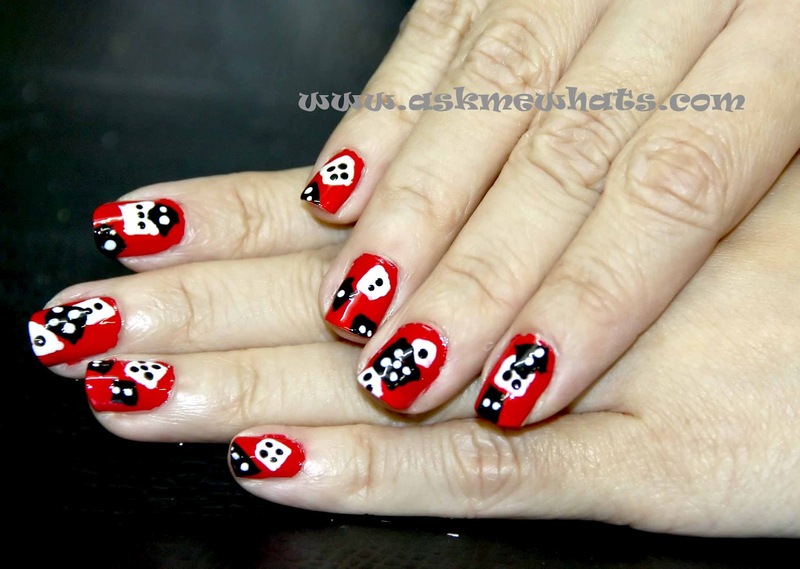 For more variation, I picked L.A. Art Deco Polish in Black and create another box beside the white dice. Try to make the dice looks like it has just been thrown out of the table! 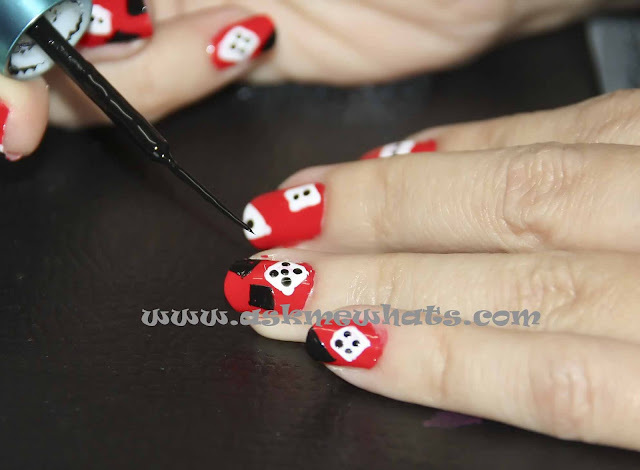 Once the black boxes are completely dry, apply white dots to complete the dice. 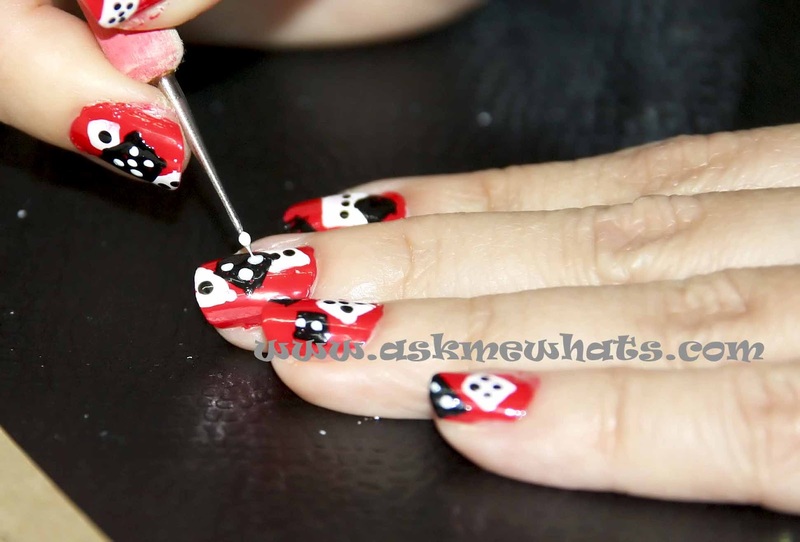 Wait for the nail art to completely dry, apply your choice of top coat. 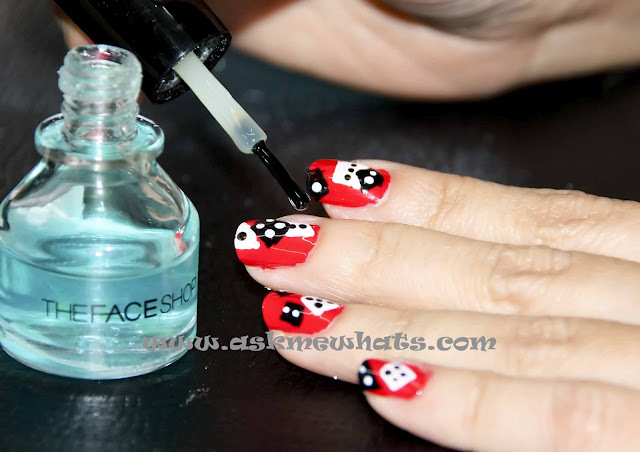 In this tutorial, I used The Face Shop's Clear Coat. 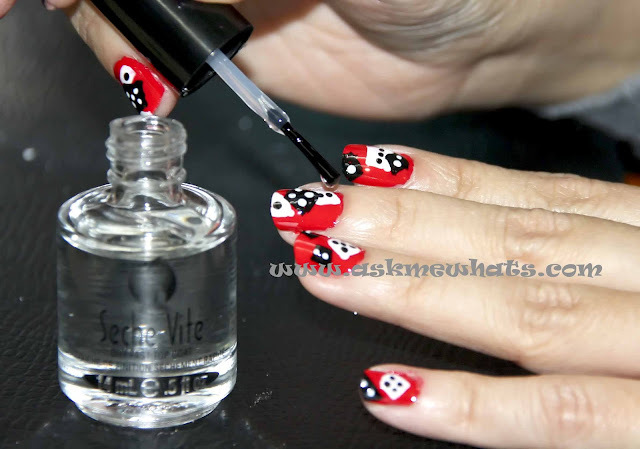 Apply a coat of Seche Vite Fast Dry Top Coat. My nail art looks more polished and definitely more quick drying! I guess I should visit Resort's World again and play the game! hehe~ This design looks great on ur nails!! Very pretty! I rested my nails for a week too! and I guess, it's time! I missed doing these :D Can't wait to see your new design! hmm gamble nails. Who would have thought of that! Very creative twin!! thank you Jenn! :) Really? red Hot Tamale sounds like a nice polish name! I am really loving this red polish shade called Fearless! LOL! natawa ako sa comment mo! Your nail post is so cute.. always so creative. thanks ! I'm glad you liked it. I love the nails! I'm not a gambler either cause I have the worst luck on earth. Feel free to recreate the designs, take care!